Southwest Florida celebrates the birthday of inventor Thomas Edison. About 300 kids took their marks at the Junior Fun run Sunday as a part of the Edison Festival of Light. It’s a celebration to remember Edison’s birthday, February 11th. FORT MYERS, Fla. — Southwest Florida celebrates the birthday of inventor Thomas Edison. 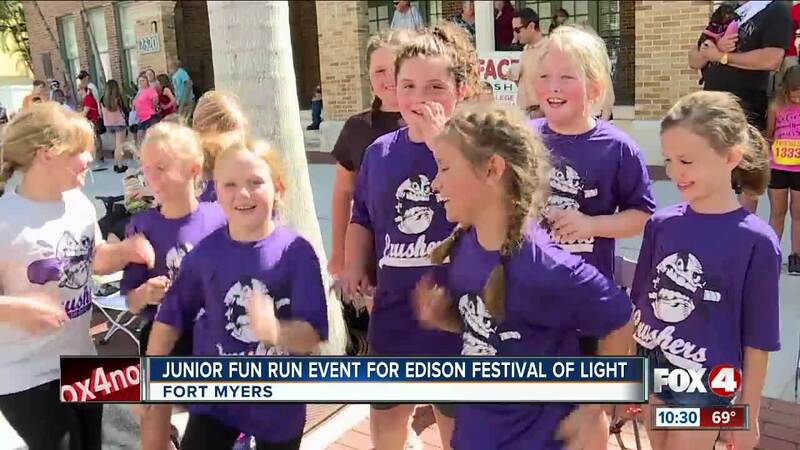 About 300 kids took their marks at the Junior Fun run Sunday as a part of the Edison Festival of Light. It’s a celebration to remember Edison’s birthday, February 11th. Coach Brad Haley of the Lee County Crushers Softball Team encouraged his girls on the sidelines before their big run. “A lot of them are only in second grade, but they’re running with the older girls so we told them to pace themselves so they don’t wear themselves out.,” he said. Kindergartner Shay Lynn Williams couldn’t wait to get started. “I’m excited to run here and all the way back!” she said pointing to the finish line. She finished strong. Jamari Jones, second grader at Edison Park Creative and Expressive Arts School said she surprised herself. “I thought I was going to be in like last place,” she said. Many kids said their favorite part of the Junior Fun Run was running with their friends. And they weren’t the only ones having a good time. Edison Festival of Light has fun for adults too. Hundreds stopped by the Garden Festival to buy everything from honey to orchids and even angel trumpets. Coordinator Lisa Wilson said it’s the place to be if you have a green thumb. “What’s really unique is you can find a lot of hard-to-find plants here,” she said. Like air plants, or plants that can grow even when they’re not rooted underground. That’s just what Vicky Goodrich Heebner found. A special treat she said for her first time at the festival. “So far we’ve made it past three booths and we bought three plants,” she said. Wilson added butterfly plants are really popular at the fest too.